Born: December 27, 1766 in Sandwich Ma. Died: October 14, 1832 at 65 yrs, 9 mos, 27 d.
1. Lydia A. Raymond Cook; (February 22, 1791 – February 1, 1876); Married John L. Cook (1785 – 1873) (John Cook & Betsy (–)) Abt.1808 & had 11 children; She died in Brighton Ma. ; Lydia & John are buried in Sagamore Cemetery in Bourne Ma..
2. Anna Raymond Gibbs; (October 23, 1793 – Bef.June 1827); Married Phineas Gibbs, Capt. (1790 – 1831) (Samuel Gibbs & Abiah Swift) in Sandwich Ma. on December 19, 1816; Phineas married (2) Mary/Polly (Hall) Hatch (? – 1840) (Stephen Hall & Catherine (–)) in int. June 9, 1827; Mary/Polly married (1) (–) Hatch & married (3) (–) Perry; Phineas is buried in Cataumet Cemetery. 3. Hannah Raymond Ellis; (August 22, 1797 – June 15, 1868); Married Stephen Ellis (1793 – 1861) (Eleazer Ellis, Jr. & Deborah (Ellis)) in Sandwich Ma. on July 28, 1816; They had 10 children. 4. Pheobe Raymond Covell Landers Adams; (September 25, 1800 – May 4, 1876); Married (1) Elisha Covell (? – 1821) in int. May 16, 1818 & married (2) Abial Landers (1794 – 1837) (Nicholas Landers & Martha Hatch) in int. January 13, 1826 & married (3) Samuel Adams, Jr. (1811 – 1879) (Samuel Adams & Catherine Patteshell) in int. September 19, 1840; Pheobe & Samuel, Jr. are buried in Pocasset Cemetery. 5. Martha/Patty Raymond Avery Hathaway; (November 19, 1802 – November 14, 1868); Married (1) Levi Avery (Joshua Avery, Rev War, War of 1812 & Phebe Nickerson) in int. February 5, 1820 & married (2) Salathial Hathaway, Jr. (1795 – ?) (Salathial Hathaway & Love (Hathaway)) in Sandwich Ma. on January 2, 1823. 6. 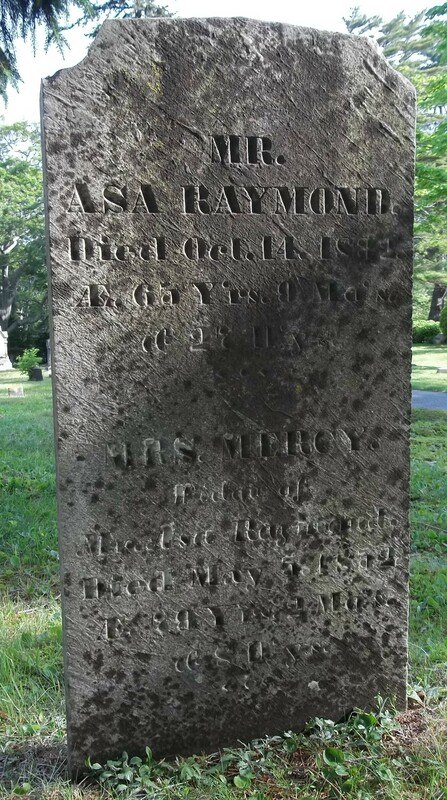 Ebenezer Raymond, Jr.; (October 23, 1804 – March 1, 1877); Married Catherine Adams (1808 – 1882) (Samuel Adams & Catherine Patteshell) in Sandwich Ma. on November 17, 1825; Ebenezer, Jr. & Catherine are buried in Pocasset Cemetery. 7. 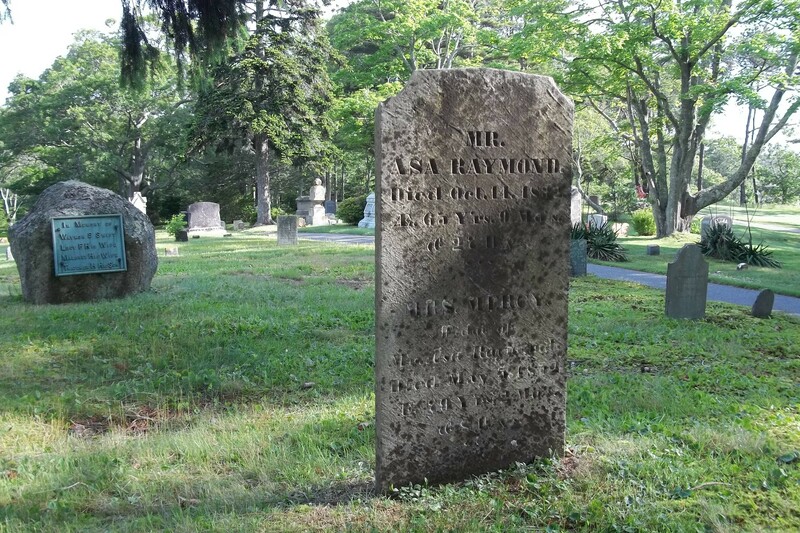 Jedidah Raymond Adams; (May 12, 1810 – March 29, 1879); Married Thomas Adams (1802 – 1886) (Samuel Adams & Catherine Patteshell) in Sandwich Ma. on August 7, 1826. 8. Achsah/Excy Raymond Hall Clement; (November 29, 1812 – May 10, 1853); Married (1) Joseph Hall, Jr. in Sandwich Ma. on July 2, 1830 & married (2) Isaac Clement (Abt.1803 – 1887) (Isaac Clement & Mary (–)) in Sandwich Ma. on January 30, 1840; Isaac married (2) Mercy A. Barker Godfrey (1809 – 1859) (Jonathan Barker & ?) in Sandwich Ma. on July 29, 1855 & married (3) Lucretia Chase Howland (1832 – ?) (Kelly Chase & Polly (–)) in Sandwich Ma. on September 10, 1864 & married (4) Elizabeth Kimball Caldwell Sampson (1822 – 1892) (Harvey H. Kimball & Abigail Thomson) in Sandwich Ma. on July 3, 1871. 9. Asa Raymond, Jr.; (September 3, 1817 – November 16, 1898); Married Eliza Ann Lumbert (1817 – 1895) (Hezekiah Lumbert & Mary (–)) in int. December 7, 1839; Asa, Jr. & Eliza are buried in Pocasset Cemetery.